It all started on Sunday, I was feeling feverish but I couldn’t skip out from work because no one will be there to cover for me. So I just had to visit the clinic every once in a while to check on my temperature and to get all sorts of medicine. I made it through the end of my shift. I even made it to Pasay where Alfred’s mom prepared bulalo for lunch. It was the feast day of their Parish so there were people out celebrating everywhere. The soup did me a lot of good. I felt better, and almost forgot everything I had complained about. Back home though, it was the same deal again. Still, I had to go to work. I went to the clinic early in my shift to hopefully catch the doctor. Unfortunately, he had already left. Early. Earlier than the 6am he was supposed to close shop. The nurse checked my temperature and took a peek at my throat. All’s just swell, she says. Duh, I’d just had a cold bath at 4 in the morning! Of course I’d have normal body temp. hehe. I endured for three more hours before going back to the clinic. The “lead” nurse was on duty. She gave me three different kinds of medicine – one for coughs, another for colds, and yet another for the body pain. If I wasn’t better in two hours, she says, come back. So two hours later, I was back. She sent me home. Finally. I went straight to Humana, a medical clinic, to consult with a doctor. A CBC was ordered and results ruled out Dengue. My WBC was high, and so were the Segmenters. 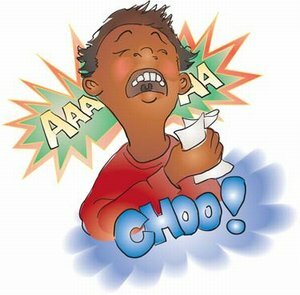 The nice doctor says the former pointed to an infection, while the latter suggests that it’s bacterial in nature. So here I am with a prescription for antibiotics, two kinds of cough/cold medicine (one for dry cough, another for when my cough has phlegm). So I’ve been laying low and hadn’t been online that much. Drink up, rest, sleep, and get better. That’s what I’m doing. And trying not to spread this around. 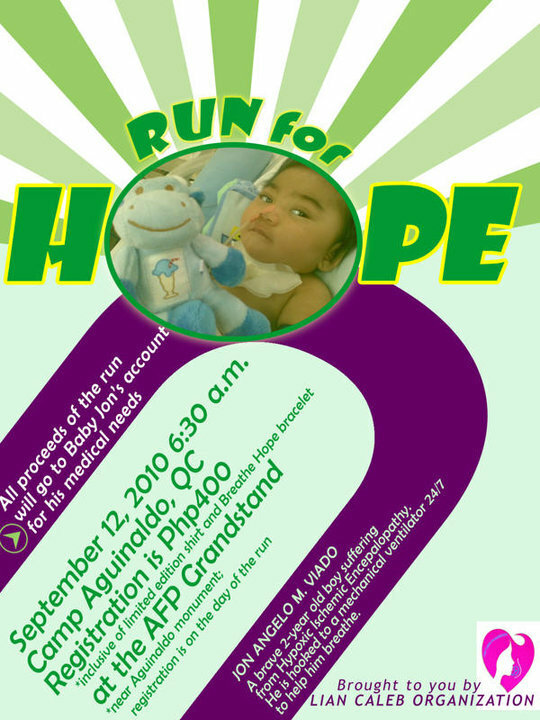 This Sunday, there will be a fundraising fun run for Jon Angelo’s Breathe Hope campaign. I would so love to go, but I have work that day from 5am. But if you have time, and you’d like to run for fitness, and help at the same time, do Run for Hope! Video lifted from Pia Magalona’s Multiply site, as a teaser for their campaign to raise awareness of the Cervical Cancer vaccine. Their clothing line FMCC has Laban ni Maria shirts. Since the availability of an anti-cervical cancer vaccine in the country was announced, I have wanted to avail of the shots. Yesterday, while waiting at the OB-GYN’s clinic, I finally got to ask the doctor’s assistant for info on them. The vaccine is administered in three shots within 6 months of the first one. Each shot costs either PhP3,500 or PhP4,500 depending on the brand. The difference, according to the lady, was that the more expensive one prevents the strain causing genital warts as well, while the other doesn’t. The cost is considerable, but if you weigh it to the fact that you get protection from cervical cancer, then it does seem worth it. I wonder though, can anyone recommend another hospital or doctor that may be offering the same vaccines at a lower cost? I could have asked at the Medicard clinic, but they would refer me to another OB-GYN in the same building. I feel a bit disloyal having to go to someone else, haha. So if you’ve had your shots from a different clinic or doctor at a lower cost than what was quoted here, would you please be so kind as to give me a recommendation? I would appreciate it. Why is important to get the Cervical Cancer vaccine? An article from the Mayo Clinic website mentions that in the US alone, 40% of those diagnosed with this disease die. In the Philippines, about a third of those infected do not get well. Cervical Cancer also strikes at any age, could be when a woman is still young and about to start a family. There are two types of vaccine available, both blocks HPV types 16 and 18 which causes about 70% of cervical cancer cases (source). One of them, Gardasil, also blocks types 6 and 11, which though not associated with Cervical Cancer, are associated with genital warts and mild Pap test abnormalities. I guess this is what the doctor’s assistant was referring to as the more expensive brand and if so, I don’t see anything wrong with going with the one from GSK. Girls as young as 10 years old may already avail of the vaccine. This is recommended so their immune system sets in before the virus and the cancer even has a chance to step in and develop. I encourage girlfriends to consult their doctor soon, and avail of the cervical cancer vaccine. This can even be our ‘bonding’ activity. Let’s go together, and then do something fun after the shots.